GIGABYTE have long been recognised as a major player in the PC component market, releasing a range of hardware for businesses, cost-conscious gamers and enthusiasts alike. The Taiwanese company was founded way back in 1986, and in the intervening years has become a fixture in consumer electronics in both Eastern and Western markets. We perhaps see them as most notable for their mid- and high-end motherboards and VGA cards, components with which they now have extensive experience and an impressive portfolio, but they have increasingly branched out beyond that somewhat fickle industry. Indeed it was at a UK event taking the wraps off their much-vaunted GTX 680 SuperOverclock that we first spied the peripheral we're reviewing today. Before we get to that however lets provide a little background on GIGABYTE peripherals. Perhaps overshadowed by their strong component lineup the GIGABYTE peripheral range, contrary to what you might expect, debuted many years ago. Initially centred around business use, the middle of the previous decade saw them expand into the cost-conscious gamer segment, with often strong but sometimes mixed results. Always featuring striking aesthetics, the M/K and Force ranges service the cost-conscious consumer well, yet GIGABYTE seemed to have difficulty breaking into premium range successfully. 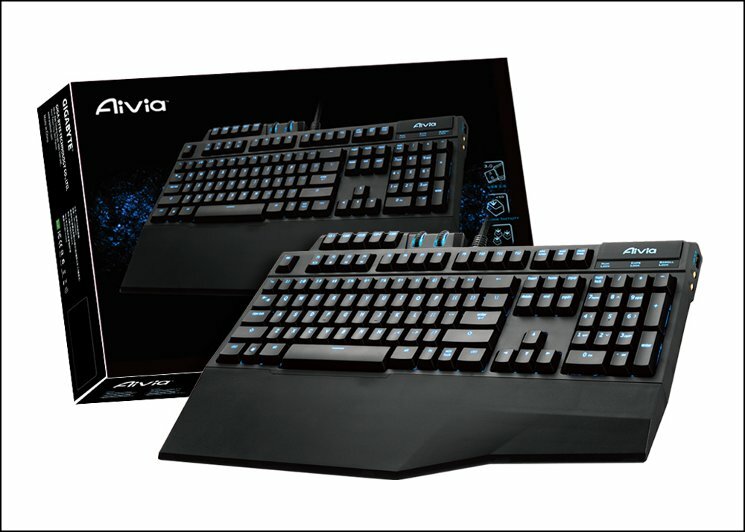 GIGABYTE introduces you the whole new premium gaming keyboard, Aivia Osmium Mechanical Gaming Keyboard. The blue Platinum group metal “Osmium” is the heaviest element at normal conditions. Its’ hard, rare and noble nature represents ultra durability and luxury of Aivia Osmium Mechanical Gaming Keyboard. It not only features Cherry Red mechanical key-switches, but is also exclusive built with an USB3.0 hub. Aivia Osmium is utilizing the revolutionary anti-ghosting matrix key-switch design, and innovatively features dynamic volume and backlit wheel controllers. Price a hair under £110 in the UK, the Osmium occupies a position at the high end of the market, commensurate with the flagship mechanical keyboards of many competitors. In this respect GIGABYTE will need to leverage additional features to push the Osmium ahead of the pack.